It seems that no matter where you go in Japan, there is always a vending machine stocked full of refreshing beverages standing ready to go, right where you need it, be it at a subway station, two steps outside your hotel, on a boat, or tucked away in every little corner and alleyway you can think of. 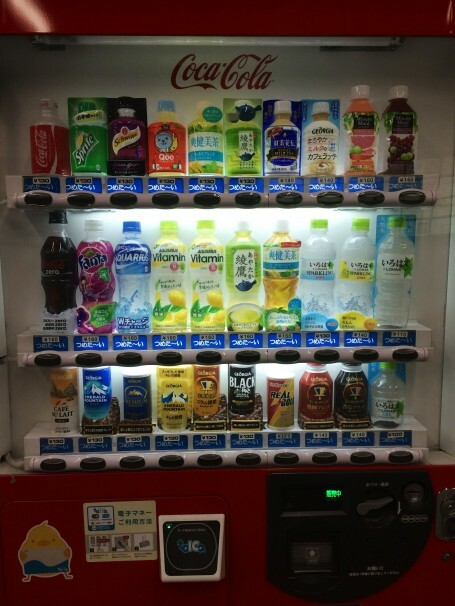 This phenomenon of availability benefits anyone and everyone, from students and city workers to stressed salarymen, and the ability to always purchase a water, coffee, tea, or soda of your choice in less than 30 seconds makes the vending machine a modern marvel of efficiency and independence. Thus, it is in many ways a symbol for modern Japan, and the culture of an effective, visually aesthetic, fast-paced life. Something I’ve noticed is that I’ve yet to find a Japanese vending machine that has failed to work, or see one that is actually out of stock of more than one out of the 15 to 25 different kinds of drinks each one offers. 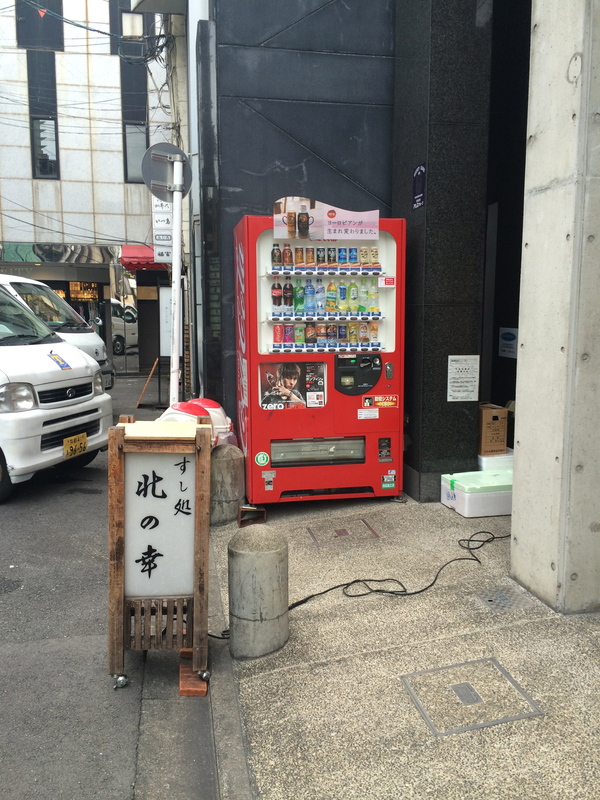 Even when tucked away in the most obscure parking lots and alleys, each and every Japanese vending machine is always somehow miraculously stocked, cleaned, and in perfect functioning condition. This really makes the Japanese vending machine stand out compared to the U.S., where I am very used to seeing out of stock, seldom used vending machines in odd, out-of-the-way places that are so unappealing I’d never want to use them. Also, Japanese vending machines dispense drinks faster, have more variety, and have fewer problems than any U.S. vending machine I’ve ever used, and they are also faster than just about any cashier at a traditional store. These advantages, coupled with the fact that they are almost everywhere, make the Japanese vending machine ideally suited to people on the go who need things to be fast, convenient, and always available. Vending machine on the boat to Miyajima island! They are everywhere… even in random alleys! The presentation of the product in Japanese vending machines is also key to what makes even the most unfamiliar drink look more appealing than many of the most well known items in a U.S. machine. Japanese vending machines turn the drinks from just a product to an element of design and display. The drinks are lined up in a window to highlight each and every one equally, as well as display the sheer variety available, as though you are gazing at a special storefront window designed just for those drinks alone, and you know exactly what you are getting as soon as you press a button. In this way, they become little mini stores in themselves, integrating aesthetically and efficiently with their environment. In contrast, American vending machines tend to have little aesthetic appeal, using either cheesy images or showing a much more limited selection of drinks casually lined up inside, as though how they look or their individual appeal doesn’t matter, which turns such vending machines into eyesores rather than enticers. Japanese vending machines use the power of visual aesthetics to make their drinks appetizingly beautiful and unique, while U.S. vending machines tend to treat their products like common commodities that exist solely for the purpose of selling a product, rather than trying to make the experience appealing or pleasing. 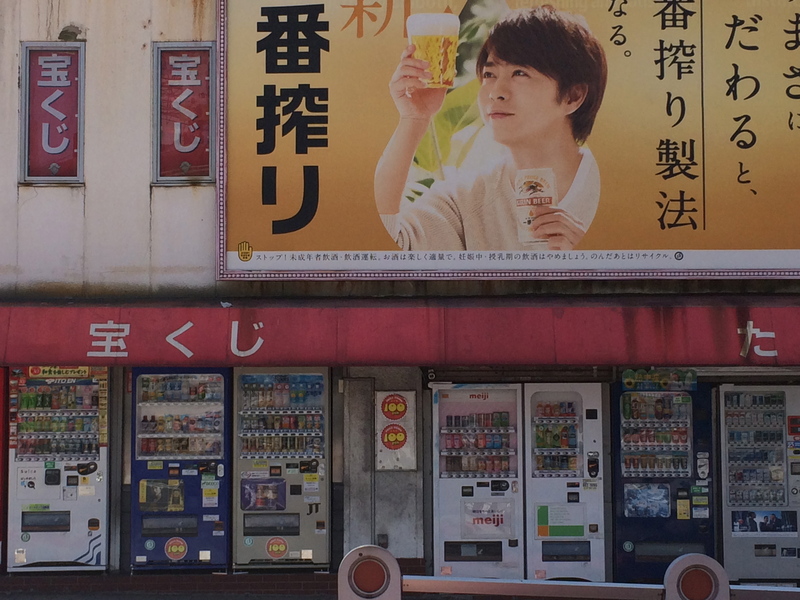 The beautiful aesthetics of Japanese vending machine presentation. In addition, in the U.S. it is almost an expectation that a vending machine now and then will simply swallow your money and fail to dispense anything, or even worse, attempt to dispense the item but have it get stuck halfway off the rack, unable to be removed from the machine. In Japanese vending machines, however, these problems don’t seem to exist. You can’t see the internal workings of Japanese vending machines the way you can with U.S. ones, which did make me uneasy the first time I used one, because I was almost expecting the drink to get stuck somewhere inside and never know what happened to it. However, that has never been the case, which further enhances this image of efficiency. The ability of Japanese vending machines to function perfectly every single time is what makes them so useful; if they were to have the same number of defects and failures that U.S. vending machines tend to have, they would likely be far less prevalent than they are today, because in Japan’s fast-paced culture, ineffectiveness and inefficiency are quickly replaced. Janet using the ever-convenient vending machines in Kyoto. What makes these vending machines uniquely Japanese, though, is that they represent total efficiency in the most unobtrusive space- and time-saving method possible. 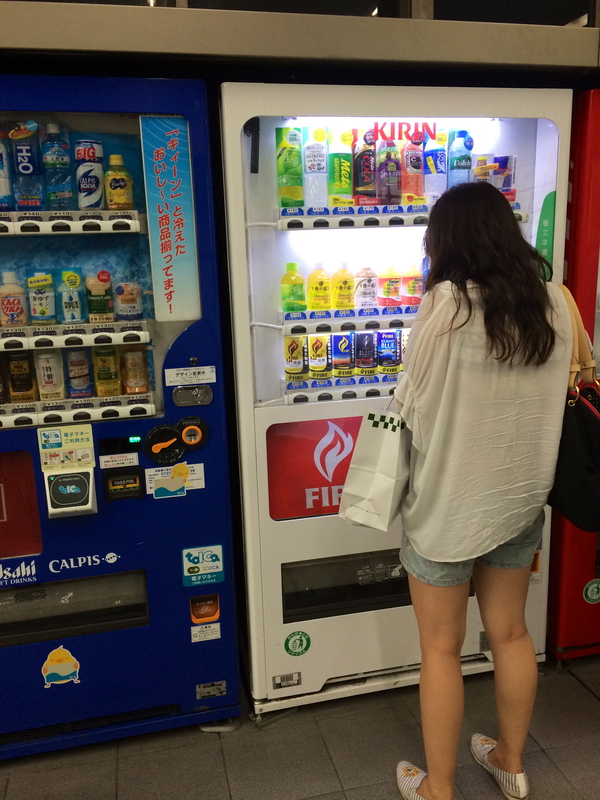 The concept of the Japanese vending machine centers on making the most of the smallest space possible while not sacrificing any variety or efficiency in the process. In fact, it actually seems to facilitate the use of space, as vending machines always seem to fit nicely and compactly into wherever they are placed, regardless of how arbitrary the actual space itself is. 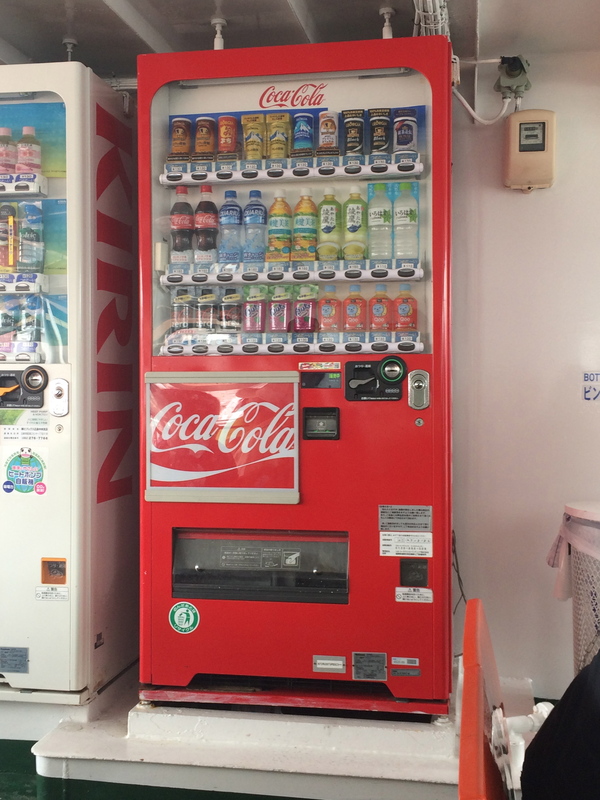 Thus, in conjunction with its uniquely beautiful aesthetics and track record of nearly flawless functioning, the Japanese vending machine is indeed one of the best and most prevalent symbols of modern Japan.